Most Sales and Service organizations lose insight into productivity when their teams are in the field. Learn how leading organizations are turbo-charging mobile workforce productivity, gaining real-time insights, and optimizing their business with location. 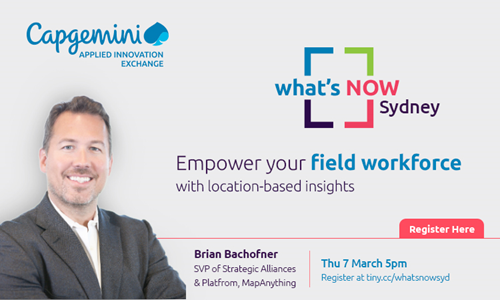 Join us for drinks, nibbles and an expert talk with Brian Bachofner, Senior Vice President of MapAnything in Capgemini’s Sydney office. MapAnything is a pioneer in Location-of-Things (LoT) software, enabling more than 2,000 global enterprises by combining location intelligence, integrated asset tracking, and route optimization to drive productivity and a better customer experience. MapAnything is a Salesforce Premier ISV Partner, a ServiceMax Strategic Partner, and a ServiceNow Technology Partner who has received IDC’s Innovator Award in Field Service for Manufacturing, and G2 Crowd’s Leader for Field Service Management and Field Sales Tools. To learn more, visit www.mapanything.com. Prior to MapAnything, Brian spent over 15 years working across Sales, Sales Management, Alliances and Marketing at Experian, Hoover’s, Dun & Bradstreet, InsideView, and leadspace. In these roles he brought a unique blend of strategy and focused execution to effectively translate big ideas into revenue. Capgemini AIE Melbourne presents Soul Machines: Humanising Artificial Intelligence. Join us for drinks, nibbles and an expert talk in Capgemini’s Melbourne office. Learn how the personification of your brand can deliver an incredibly engaging customer experience at scale. This session will feature a live demo of an artificial human and real-life case studies. Co-founded by Academy Award winning ‘Avatar’ and ‘King-Kong’ animator, Dr Mark Sagar, Soul Machines is a groundbreaking AI company based in Auckland. Building a HumanOS for Artificial Intelligence, Soul Machines’ technology allows us to communicate, connect and relate to AI in ways that make it accessible, contextual and trusted. By creating a new type of Artificial Intelligence called Experiential Learning – and the world’s first Digital Brain – technology is radically humanised, delivering personalised human-like experience and connections at scale and operating independently. Soul Machines’ breakthroughs in Experiential Learning add human intelligence to AI, taking interactions beyond algorithms and enabling digital beings to accumulate experiences, learn, and respond emotionally. Their Digital DNA Studio creates incredibly lifelike, emotionally responsive digital humans which are then autonomously animated with a cloud-based, AI-powered Digital DNA Engine. No actors, no motion capture cameras – just incredibly life-like interactions between your brand and your customers. Experience AI like never before. 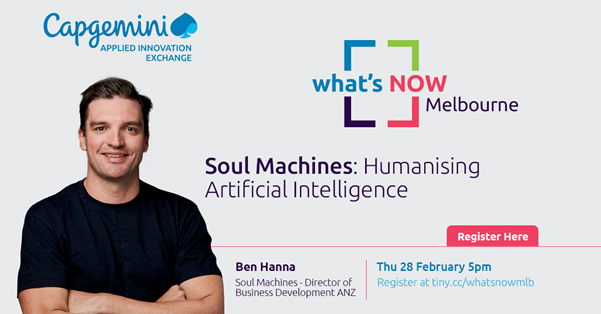 Ben Hanna is a Melbourne based technology veteran, leading growth and business development for the NZ high-tech and AI company Soul Machines. Ben started his career in tech with 10 years at Systems Integrator Gen-i (now Spark Digital) managing strategic relationships with some of New Zealand’s largest companies. He graduated through their management development program, and then took a role with NZ company Jade Software launching a new mobile development platform called JOOB Mobile into the USA, and Australian markets. Ben has worked at global Infrastructure company Dell EMC, and launched two small start-ups Feetware – an online retailer and Hooha – a cloud based CRM platform for small businesses. More recently, Ben spent 3 years into Utah-based business optimisation and big data company Domo, leading their Enterprise efforts for the southern half of Australia and New Zealand through a phase of high growth and IPO. What’s Now Sydney: Rapid and scalable digital transformation to keep up with the pace of regulatory change. 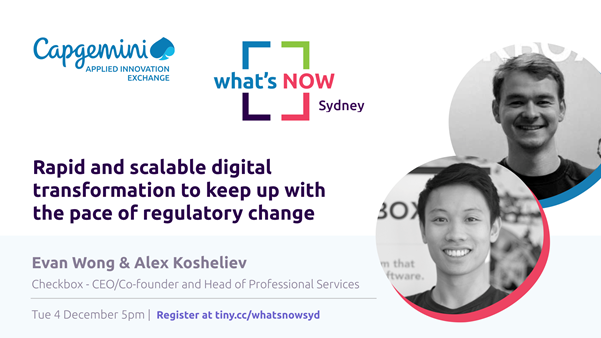 Capgemini’s Applied Innovation Exchange presents December’s edition of What’s Now: Sydney, Rapid and scalable digital transformation to keep up with the pace of regulatory change. Join us for drinks and an expert talk in Capgemini’s Sydney office. In light of events such as the GDPR launch in Europe and the Financial Services Royal Commission in Australia, there is one word that has dominated 2018: REGULATION. No matter which industry you operate in, regulations are becoming more and more complex and increasingly difficult to keep up with. In this talk we are joined by Evan Wong (CEO/Co-Founder) and Alex Kosheliev (Head of Professional Services) from Checkbox, a multi-award winning platform that transforms regulations into software. Evan and Alex will discuss the effects regulation changes have on businesses, and how businesses can adapt by streamlining processes, whilst also uncovering opportunities to enhance their customer experience, keep customers sticky and even generate new revenue streams. Checkbox is a multi-award winning platform that enables the digital transformation of regulatory processes into software applications, all without coding. Checkbox allows users to rapidly build and deploy applications that produce automated assessments and documentation by seamlessly integrating the concepts of a form builder, visual decision-tree mapping, spreadsheet, and document automation. 5:30 – 6:00pm: Rapid and scalable digital transformation to keep up with the pace of regulatory change. 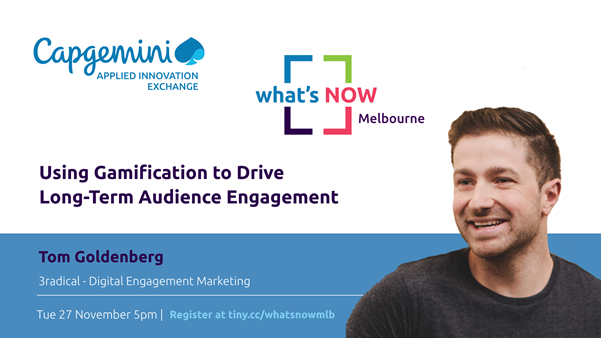 Capgemini AIE Melbourne presents Using Gamification to Drive Long-Term Audience Engagement. Join us for drinks and an expert talk in Capgemini’s Melbourne office. By combining game science with technology, organisations can drive desired audience behaviours that not only help them achieve their corporate goals, but that help garner valuable insights and data along the way. Speaker Tom Goldenberg leads the commercial and strategic arm of 3radical in Australia, providing advice and consultation to clients and partners on how gamification can be used to improve businesses. 3radical is a software company that helps organisations better connect with both their consumers and employees. 3radical’s Voco platform allows brands to invite individuals to enter into rewarding experiences that combine fun mechanics with incentives to elicit initial engagement and ongoing participation. The result? Two-way conversations that build stronger emotional connections, enhance loyalty and contribute to an increased commercial performance. Tom works with brands across Australia, helping them to better engage their audiences through the application of game mechanics and technology. By working together to improve both customer and the employee journeys, he supports organisations in achieving their corporate goals. Capgemini Applied Innovation Exchange presents the first edition of What’s Now Sydney. 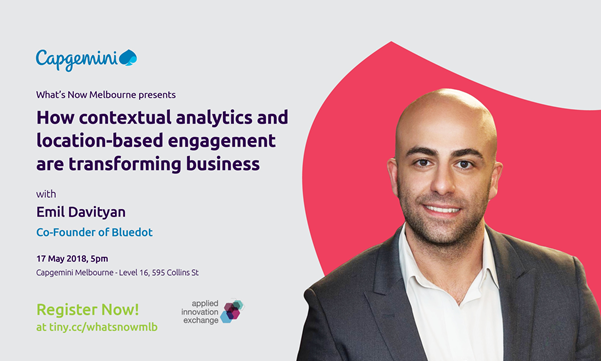 Join us for drinks, nibbles and an expert talk with Chris Baudia, CEO and Founder of GeoMoby at Capgemini’s Sydney office. GeoMoby’s Location Intelligence platform and real time analytics provides managers and executives with new insights into performance relationships within their own companies. With more visibility from rich insights gleaned from GeoMoby’s all-in-one contextual data, analytics & geofencing Location-As-A-Service platform, GeoMoby focuses on solving real world problems in several industries from mining to retail, reducing inefficiencies, providing better reach to end-users, improving the bottom line and building better, more productive organisations. 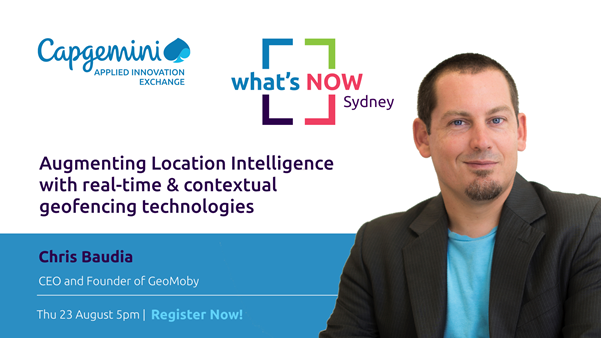 In this installation of What’s Now, our speaker Chris Baudia, CEO/Founder of GeoMoby and expert in contextual data, analytics and geofencing, will present on the latest innovations in geofencing and activity monitoring technologies and will detail use cases for several industries. Blockchain has been hailed as one of this century’s most disruptive technologies. The way we transact, store data and engage with businesses is being globally revolutionised. Blockchain enables numerous use cases and could replace systems of authority, including centralised banking platforms. This installation of What’s Now will use real-world applications to exemplify how blockchain impacts traditional business models and global industries. Speaker John-Paul Thorbjornsen is CEO of CanYa and an expert in blockchain and token economics. 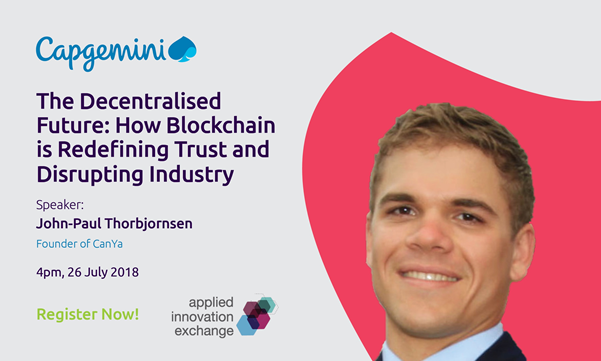 John-Paul will detail his experience in founding and scaling a decentralised, autonomous business that utilises blockchain technology and cryptocurrencies. John-Paul Thorbjornsen is a former Air Force pilot, early Bitcoin adopter and blockchain ambassador. John-Paul founded CanYa, the world’s first blockchain-based, peer-to-peer marketplace for local and digital services powered by cryptocurrency. Last year CanYa gained global attention for its aggressive growth when their ICO (Initial Coin Offering) raised $A12m. This was the second most successful ICO in Australian history. This talk discusses the power of location-based technology, analytics and engagement via mobile devices to transform businesses across multiple industries. Hear how leading brands and enterprises globally are leveraging mobile-based location services to have a complete understanding of their customer across all of their touch points, to drive personalized and meaningful engagement at scale, and create new markets and business lines with customer-centric strategies. This talk will build upon a snapshot of the latest technology to explain industry trends and highlight powerful case studies in the market. Speaker Emil Davityan joins us during his Melbourne visit from his base in Sillicon Valley. Emil is the co-founder of Bluedot, an Australian and Silicon Valley R&D and technology startup that specialises in high precision location-based services and payments. Bluedot technology powers contextual analytics and mobile engagement for major enterprises globally, including Transurban and Salesforce. The company has been recognized as Australian Startup of the Year, and Emil as a Top 50 Male Entrepreneur Under 40. Emil has formerly been an advisor to successive Australian Prime Ministers on international economic policy and also cyber and technology policy. 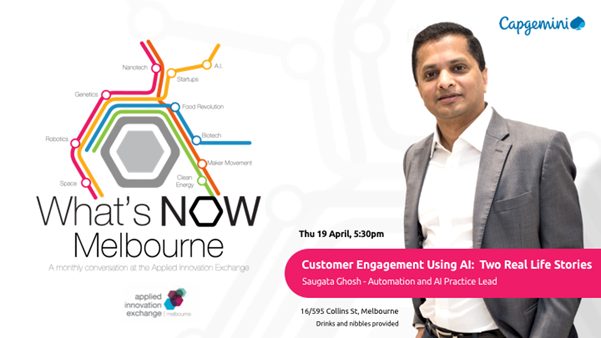 Capgemini AIE Melbourne presents Customer Engagement Using AI: Two Real Life Stories. As the second-largest health insurance provider in New Zealand, nib thrives on embracing New Zealand’s diversity and serving new customers profiles in new ways. Instrumental to this strategy, nib’s website features Frankie, a virtual consultant that works 24/7 to provide immediate answers to customers about their health insurance coverage, claims, etc. On the other side of the globe, leading European airline SAS leverages the power of Watson Conversation to enable the Pepper robot to automatically answer flight booking queries. This session presents the experiences and lessons in creating these solutions, both built through strong partnerships between the customers, Capgemini/Sogeti and IBM. Speaker Saugata Ghosh is a Capgemini expert in Automation, Digital Strategy and Innovation. Read more about Saugata here.